He's baaaack. Or trying to be. 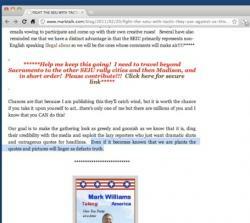 Mark Williams was booted out the Tea Party because of his insane, racist screed against the NAACP. Is he that desperate to get some publicity? The Wisconsin protests are really messing with their heads because goons like Williams are calling for people to lie and try and sign up to be actual organizers. UPDATED: His post is very confusing and now his site link is broken so I've had to update this post, but this is how his rant started. That link will take you to an SEIU page where you can sign up as an “organizer” for one of their upcoming major rallies to support the union goons in Wisconsin. Here is what I am doing in Sacramento, where they are holding a 5:30 PM event this coming Tuesday: (1) I signed up as an organizer (2) with any luck they will contact me and I will have an “in” (3) in or not I will be there and am asking as many other people as can get there to come with, all of us in SEIU shirts (those who don’t have them we can possibly buy some from vendors likely to be there) (4) we are going to target the many TV cameras and reporters looking for comments from the members there (5) we will approach the cameras to make good pictures… signs under our shirts that say things like “screw the taxpayer!” and “you OWE me!” to be pulled out for the camera (timing is important because the signs will be taken away from us) (6) we will echo those slogans in angry sounding tones to the cameras and the reporters. (7) if I do get the ‘in’ I am going to do my darnedest to get podium access and take the mic to do that rant from there…with any luck and if I can manage the moments to build up to it, I can probably get a cheer out of the crowd for something extreme. You might remember when he went on TV and said this: Teabagger Mark Williams says: 'Obama is an Indonesian Muslim turned welfare thug and a racist in chief' and tries to defend it! Even if that fails he'll still try to go all August Town Hall on the events. Too bad, the people trying to protect their collective bargaining rights deserve better, but they must know to expect more of this. As for Williams, once a creep, twice a creep, three times a creep---always a creep.